You can't keep a dead man down on Gotham. Azrael gives us some wild moments, some bits of comedy, action and some simply fantastic moments where all the various threads of Season Two are coming together. It's another wild hour on Gotham, and leaps above the struggles of Season One. At last, the demonic experiments of Dr. Hugo Strange (B.W. Wong) have come to fruition and he has managed to bring someone back from the dead. It is Patient 43, formerly known as the late former Gotham Mayor Theo Galavan (James Frain, who I wish would play a comedy after playing villains here and in The Cape and The Tudors. Yes, I consider Thomas Cromwell a villain). His memory all a blur, he goes into hysterics trying to remember who he is. Mrs. Peabody (Tonya Pinkins) wants Patient 43 put down as too unstable but Strange will have none of it. "Strong as an ox. Fast as a snake..." Strange comments on seeing Galavan. "Mad as a hatter," is Mrs. Peabody's retort. In any case, Galavan has come at the most opportune of times, as Jim Gordon (Ben McKenzie) is closing in on proving that Strange was behind the Wayne murders. Strange convinces Galavan that he is Azrael, an ancient knight in the Order of St. Dumas, and his new mission: kill Jim Gordon. 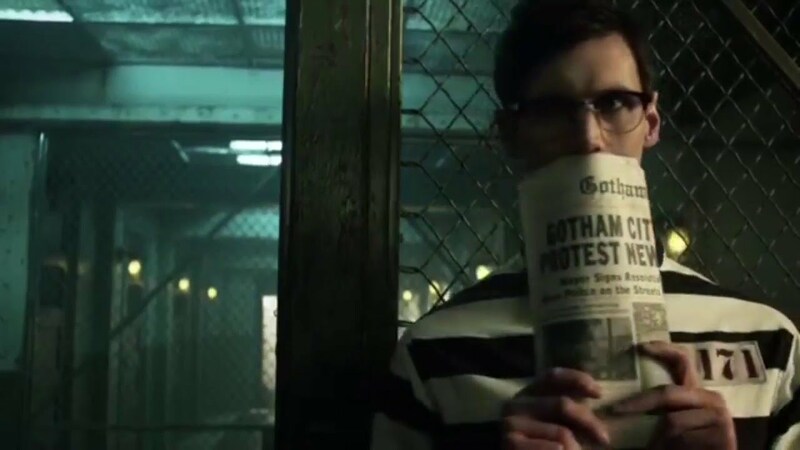 Meanwhile in Arkham Asylum, Edward Nygma (Cory Michael Smith) suspects that Strange and Peabody are up to something and is determined to find out what it is. By the end of the episode, he does discover what is Indian Hill. As Azrael hunts Gordon down, he, along with Bruce Wayne (David Mazouz) tries to convince Captain Barnes (Michael Chiklis) of Strange's involvement with the Wayne killing, who should pop in but some crazy cape-wearing figure who is out to kill Gordon! Azrael fails to kill Gordon this time, fleeing into the night and astounding Young Master Bruce. Well, it's off to the GCPD for Gordon for his 'protection', but as we all should know by now, the GCPD is the WORST place to take someone in order to protect them. This would be the what, third or fourth time it has been attacked. Again, Azrael fails to kill Gordon, but after fighting with Barnes, he is unmasked to see that it is Galavan, shocking the almost-always unflappable Barnes. Azrael flees again, but not before crashing onto a police car on live television, where it seems everyone in Gotham is watching. That includes Theo's sister Tabitha (Jessica Lucas) and her two lovers, Barbara Kean (Erin Richards) and Butch Gilzean (Drew Powell), as well as Oswald Cobblepot aka The Penguin (Robin Lord Taylor), still wandering around the house with the corpse of his late stepmother at the dining room table. There are at least two things that push Azrael down for me. The first is the entire 'take someone into the GCPD HQ to protect them' business. As I stated earlier, this is probably the third time the GCPD has been attacked, making it the most inept police department in history. The Keystone Kops have a better track record. There was when The Electrocutioner attacked the police station, there was when the Maniax stormed the GCPD and killed Commissioner Essen, and now this. For being the center of police in Gotham City, it looks like the cops need the protection. The second is the incriminating photograph that names Dr. Strange as "The Philosopher". Not only does it strike me as rather convenient to have his nickname there (and that he would use that name as his nom de assassin), but it looks so fake I could never shake the idea of how bad it looks out of my head. Yet, apart from this, Azrael is one of if not the finest Gotham episodes we've had, with only three more to go before wrapping up the season. You have a whole cacophony of great performances that cataloging them seems to be more a credit listing than anything else. Frain has never been better as the completely out-of-his-mind Galavan/Azrael. He had that menacing, murderous manner, but he also brought Galavan's genuine confusion and fear into play (such as a scene when he sees an old Galavan for Mayor poster and puzzles over it, struggling to remember something about it that relates to him). He even has a moment of comedy while killing someone. Dr. Strange has brought his "Sword of Sin" to the demented knight in a case. He tells Galavan/Azrael to use it to kill...and he ends up using the case, unaware that he was to open it. Even though he had one scene, Robin Lord Taylor continues to astound as The Penguin, his sense of righteous fury (more than genuine shock at seeing his hated archnemesis return from the dead) chilling, yet making us intensely curious how he will bring down the man who murdered his beloved mother. More prominently featured is Cory Michael Smith as Nygma, still not yet The Riddler, but a shrewd figure who is dangerous due to his intelligence. He too has a bit of comedy when he assembles his minions to bring him things to help him search out Arkham incognito. Mazouz is quickly coming into his own as Bruce Wayne (and may in fact be setting the standard as to how to play a pre-Batman Wayne). His astonishment at seeing Azrael leap about in his cape makes us wonder whether Bruce is getting inspiration from Azrael about adopting a persona to be that crime-fighting masked vigilante; he also exhibits confidence when he tells Barnes off (informing him he finds Barnes' attitude flippant...how WASPy is our Bruce). We also get nice bits of foreshadowing that don't come across as forced like when Gordon replies to Barnes' flippant attitude that maybe Gordon ought to be running the GCPD with "Maybe one day I will" (since we know he will) or when Barnes decries this idea of a 'loose cannon vigilante' in front of Bruce Wayne. The cinematography continues to be simply brilliant and the editing, particularly when we see Galavan's jumbled memories or our various players discovering Galavan's demented resurrection. Azrael does just about everything right, and justifies the idea that Season Two of Gotham is more focused and leaps and bounds better than Season One (even though I thought that season was pretty good too). As we come closer to the end of Season Two, Azrael is another in the 'win' column.